Get a wealth of legendary cab tones in one convenient pedal. Electric guitarists looking for the perfect way to mike up for live or for recording now have one of the simplest and most workable solutions available - which also sets new standards in sound quality. Brought together in a compact, lightweight metal box are 16 legendary speaker cabinets. Drawing on 30 years of both stage and studio experience, I have put together a collection of my own. Recorded with the best microphones and digitally converted using today´s cutting-edge Convolution Technologie, locking down every detail. But why conserve the sounds digitally? Simply because analogue equipment cannot capture all the acoustic complexities and nuances the speakers produce. Convolution Technologie on the other hand is able to reproduce the complete array of tones and the uniqueness of each cabinet down to the last detail. Just pick your favourite cab, fine-tune the sound with the Mic-Position controller and away you go! 16 classic, world-renowned cabs are available in the BluBox: 5 legendary Marshall cabs with vintages from 1965 and 1980 but also the glorious, cult cabinets from Vox, Mesa-Boogie and Fender. 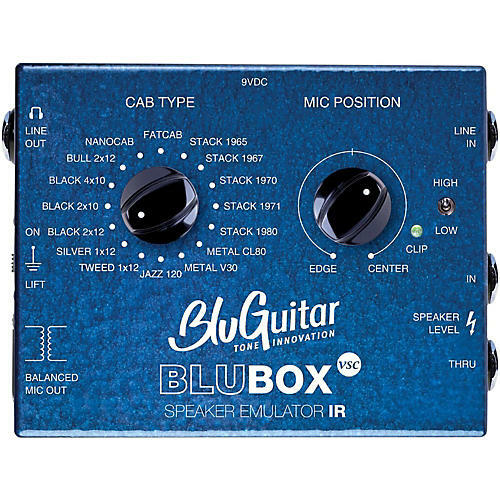 Of course, I have also included the BluGuitar NANOCAB and FATCAB which have been rapturously received in music world for their huge sound. BluBOX is the ideal partner for all eventualities. Whether on stage or in the studio - wherever you need striking sounds of the highest quality miked up or recorded. All this works with the BluBOX™ directly and even without a speaker cabinet!